If you've been following my blog a while now, you know that the zoo wardrobe just keeps getting bigger and bigger, and especially in T-Shirt form. I may have too many... 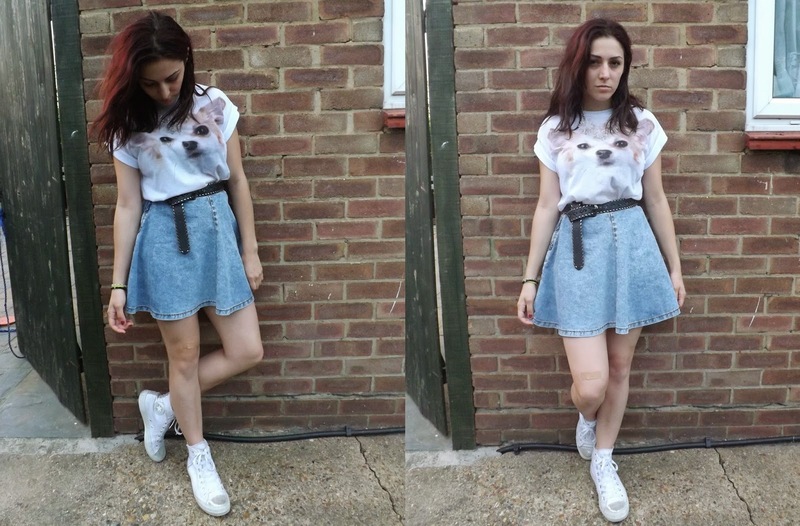 Yesterday, I wore this super cute, adorable chihuahua puppy face cropped tee with my denim skirt for a simple outfit into London with my mum for her birthday. I jazzed this outfit up with a belt and wearing converse for comfort. No outfit is ever complete without jewellery, so I finalised the look with one of my current favourite necklaces; this one of which made my little chihuahua pup look like she was wearing a tiara. Too cute! This is super cute! Lately I'm wearing a lot of transitional type dresses and playsuits with sleeves - mainly so I don't have to put a proper coat on yet!